This delightful, all original little red leather box was produced in England during the 19th century, circa 1830. The box is constructed from rich red morocco leather and is beautifully modeled as a book. The book is titled ‘Snuff’ in gilt tooled leather lettering to the spine which also features three raised leather bands. 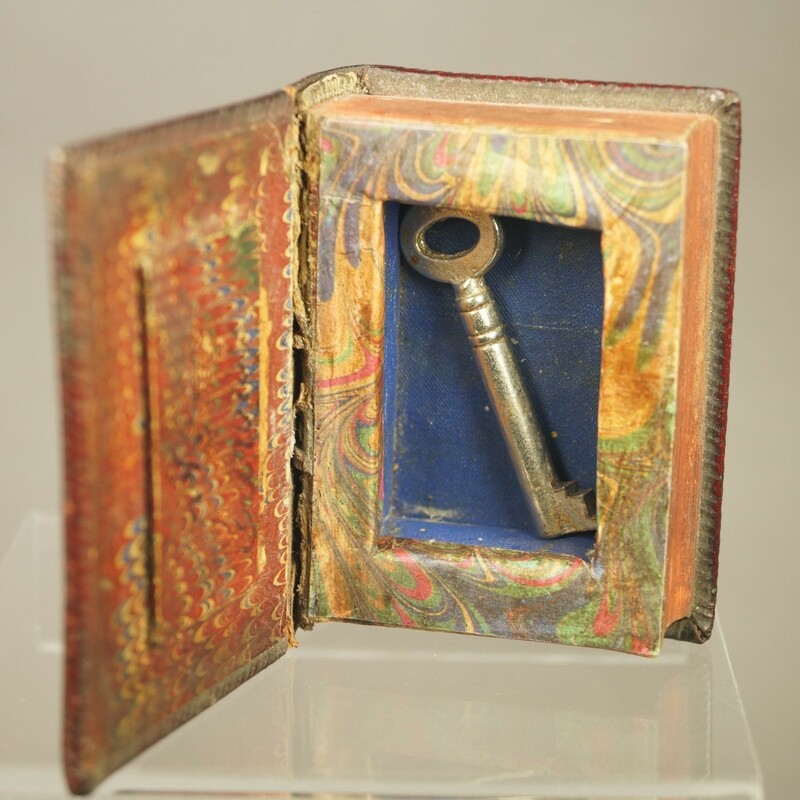 The book opens to reveal a compartment for storing a hidden item for example a key to a safe, money or a jewel. It is just as functional today for the safe storage of such an item. The inner chamber was actually cut away from a solid miniature book. Any unassuming soul would look at this small book on your desk or shelf and not suspect that it held anything other than snuff or printed pages. This is a quality and totally quirky item, we love the tooled leather covers. This item has the coloring and aged patina to die for. This is the perfect piece for a book lover or anyone who collects snuff boxes, we have not seen another like it. Please see our collection of 18th and 19th century snuff boxes listed separately in our store. Measuring: Width 2 inch (5 cm) by height 2 7/8 inch (7.5 cm). Depth 0.75 inch (2 cm). Condition: Minor age related wear to leather spine and the gutter. Minor surface wear to interior blue lining. A superb antique curio that is looking for a new home.